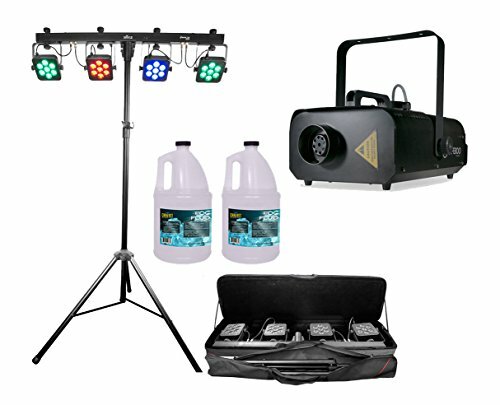 Product Description for Chauvet 4Bar Tri USB With American DJ VF1300 and Gallon of Fog Juice Package Includes: 1 x Chauvet 4Bar Tri USB 1 x American DJ VF1300 2 x Gallon of Fog Juice Chauvet 4Bar Tri USB 4BAR Tri USB is a complete wash lighting solution ﬁtted with high-intensity tri-color (RGB) LEDs that can be controlled wirelessly via the included footswitch or the optional IRC-6 controller (sold separately). It also features D-Fi USB compatibility for wireless master/slave or DMX control. A convenient tripod stand and carrying bag are included for quick and easy setup and tear down. American DJ VF1300 The ADJ VF1300 is a 1300W mobile Fog Machine that is great for mobile entertainers, medium size nightclub and bars, bowling centers and special effects productions that want to add atmosphere to their events, plus it allows people to see the beams from the lighting fixtures. The VF1300 is equipped with a high efficiency heater that quickly burns through the fog liquid. It comes with a 2.3 liter external fog fluid tank, has a fog fluid level indicator, comes with a wired remote control, and uses water bases fog fluid. Advanced features include: Electronic Thermo Sensing (ETS) for optimum heating levels, and a low fog fluid shut off sensor to protect the pump. A optional wireless remote is available separately. Gallon of Fog Juice CHAUVET® fluids are designed and tested to provide exceptional output from CHAUVET® fog, snow, and bubble machines. The use of other, inferior products can cause irreparable damage to your machine. Play it safe and get maximum output by trusting CHAUVET® fluids.